“Open Letter To Justin Trudeau, Prime Minister of Canada.” by Donald Andre Bruneau, B.Th., M.PTh. 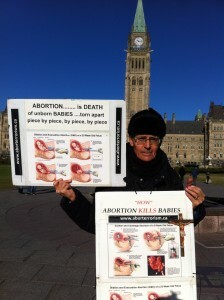 Donald Andre Bruneau, protesting the horror of ‘aborterrorism’ on Parliament Hill in Ottawa, Ontario, Canada. The abortion of baby ‘Malachi’, torn apart piece by piece. Aborterrorism is permitted in Canada from the moment of conception till birth. No protection for the unborn baby. To: Justin Trudeau, Prime Minister of Canada. By: Donald Andre Bruneau, B.Th., M.P.Th. November 22, 2015, Feast of Christ the King. Pope John Paul 11, September 2, 1996. All choices have temporal and eternal consequences. Every day in life we are faced with choices. They all have consequences, some for evil, others for good. For you, Justin Trudeau and everyone reading this, a knowledge of Deuteronomy chapter 28 is necessary to fully understand the extreme importance of this Open Letter. Deuteronomy 28 speaks in detail of the blessings if a people, a Nation, obey God and his Commandments and the curses for those who don’t. It is a very sobering warning from God, for all generations. God did not create us humans as robots or puppets, but as free agents. We are free to choose during this brief life on earth between good or evil, God or the Devil, and Heaven or Hell. As regards this ‘choice’ see following video ‘Perfect Love’: http://striveforheavennow.ca/perfect-love/ . I HAVE SET BEFORE YOU LIFE AND DEATH. CHOOSE LIFE. Rod Taylor, the leader of the Christian Heritage Party explains the outcome of Canadians’ choice during this election in his recent article: “Red Tide, Red Ink, Red Blood.” (CF: https://www.chp.ca/commentary/red-tide-red-ink-red-blood . Yes, Canada is truly covered in Red—blood and blood and more blood through woman’s “Right to Chose…to kill”. Justin Trudeau, your past political record shows us crystal clear that your choices have been for death, not for life, thus bringing upon you and Canadians, not blessings, but curses. The Devil is very pleased with you Justin Trudeau. You are doing wonders for him. If you continue your firm advocacy for abortion and the rest of the Culture of Death, you can be sure that HELL will roll out its fiery red carpet to welcome you. This is what the Culture of Death thrives on: the stealing, killing and destruction of precious human lives from the moment of their conception in their mother’s womb (Science proves their humanity begins at conception) till their death by euthanasia. Abortion is allowed in Canada because according to Section 223.1 of the Criminal Code, the baby in the womb of a woman is NOT a human being UNTIL it is completely born out of the woman alive. You, as the newly elected Prime Minister of Canada are making sure that the Culture of Death will continue to thrive by leaps and bounds in Canada…. a dying Nation. Canada is now down to 1.6 children per family. Humanity requires 2.1 children per family for its survival. Women’s ‘right to choose….to kill’ by abortion is destroying well over 100,000 precious, innocent human lives before they even get outside of their mother’s womb! This innocent blood, shed all over Canada is on your hands. It is also on the hands of all those who support ‘Woman’s right to choose’…to kill. God came to us through Jesus Christ, (cf: John 3:16) His Son, so that once this brief journey on earth is over we can choose to have ‘eternal life’ with Him. God has given each one of us the freedom to choose between good and evil, between Heaven and Hell. JUSTIN TRUDEAU—YOU ARE A ‘CAFETERIA CATHOLIC’. You are in for a tremendous shock when you die and your soul enters the next life and you suddenly find yourself before the Throne of God and experience your personal judgement. I strongly urge you to read the testimony of a dentist, a Dr Gloria Polo of Columbia. Dr Polo, like you maintained that she was a ‘good’ Catholic, even though she was pro-choice, choice to kill. She had an abortion as a teenager and later paid for many young girls to procure abortions. She was , like you, an ardent defender of women’s right to chose…to kill. Suddenly, one day she is struck by lightning and finds herself going through her personal judgement before the Throne of God. She was descending into Hell, when suddenly, miraculously, she was spared from going to Hell. A most unusual case. She knows firsthand about God’s Mercy (CF: http://striveforheavennow.ca/prayer/divine-mercy ) AND also God’s Justice! You should arrange to meet with her a.s.a.p, and hear her sobering story firsthand. You need to experience the ‘fear of the Lord’ Justin Trudeau. God is our ‘Creator’ and we are His creatures. The Almighty difference between the two!!! Our life on earth is so short. It is like a vapour. Now you see it, now you don’t! We serve a Holy, Loving God, a God of Mercy AND Justice. God does not condone Sin as He is Holy. God does not accept the killing of innocent human beings, from their moment of conception till their natural death. To disobey His Commandments, which you are freely and knowingly choosing to do with your firm and publically declared stance on abortion puts you on the list—“Destination Hell”. Wake up and repent Justin Trudeau, before it is too late and you find yourself in Hell. Auxiliary Bishop Christian Riesbeck’s and Cardinal Thomas Collins’s critique of your pro-choice advocacy in relation to receiving Holy Communion is God’s way of reaching out to you and offering you His Mercy. My Open Letter to you is again another offer of God’s Mercy to you, conditional upon your repentance. Finally, I strongly urge you to go to 65 Bank Street, Ottawa, to the abortion clinic and stand by the abortionist and personally witness a living human being that is brutally destroyed and removed piece by piece by piece from the womb. This is ‘aborterrorism’, the worst form of terrorism on the face of the earth! It is committed against the most vulnerable and innocent Canadians in the womb of a woman. You and many Canadians need to ‘see’ this to bring you to the stark reality of the horror of ‘Women’s right to choose—to kill their unborn baby’. We are on this brief journey to love God and our neighbour Justin, not to kill them. God offers those who obey and follow Him his ‘preciousness’, eternity with Him forever in Heaven. What will be your choice Justin? Heaven or Hell? I ask all Canadians to implore God’s mercy for you, Justin Trudeau, that a Miracle of conversion will take place in your soul. Donald Andre Bruneau, B.Th., M.PTh. Advocate for Life, not Death. Euthanasia and Assisted Suicide: The Results of Leaving God Out of ‘The Equation of Life’.